Erich Korngold achieved his peak early realising an international triumph in 1920 aged only twenty-three with the three act opera Die tote Stadt. 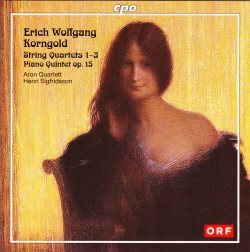 Korngold produced some fourteen chamber works in a thirty-five year period and this CPO release comprises four such all written in his typically lush romantic language. The Piano Quintet and set of three String Quartets were all written between one year and twenty-five years after Die tote Stadt. It seems fitting that this music should be played by Vienna based musicians as Korngold, for many years, considered the Austrian capital his home. Released in 2010 this is not a new issue but having reviewed the Aron’s outstanding 2014 CPO release of the Sextet, Op. 11 and Suite, Op. 23 (see review) it felt important that MusicWeb International should have a commentary on this recording of these wonderful scores. The works on this two disc set are presented in order of completion commencing with the Piano Quintet. It was Korngold who played the piano part at the première of the work given in Hamburg in 1923. Cast in three movements with the middle and Finale containing sets of variations this lasts here almost half an hour. Make no mistake this is a very fine work: highly appealing and breezy with the piano part adding significantly to the interest. There’s a handsome and comforting opening movement marked Mäßiges Zeitmaß with rising figures. One can easily imagine Korngold travelling through the verdant Tyrolean countryside on a warm spring day. From 1920/23 the String Quartet No. 1 is in four movements and was introduced in Vienna by the Rosé Quartet in 1924. It seems that an early completed section was given as a present to Korngold’s father Julius a newspaper music critic. Particularly enjoyable is the extremely lyrical opening Allegro molto. It’s bold and moody and the tender Adagio quasi fantasia feels like an intimate love letter. On CD 2 the String Quartet No. 2 was written in 1933 prior to Korngold’s first trip across the Atlantic to the United States to assist Hollywood film director Max Reinhardt. Composed mainly at Korngold’s country home in the Austrian Alps at Gmunden on Lake Trumsee this four movement score was also premiered by the Rosé Quartet in 1934 again in Vienna. In the striking opening Allegro it is easy to imagine the spectacular autumnal beauty of tree leaves changing colour. The winning Finale marked Waltz has a carefree optimism seemingly defiant of Hitler’s destabilisation efforts in Austria at the time. Following the Nazi annexation of Austria in 1938 Korngold, a Jew, fled to the safety of the United States and settled in Hollywood. It was there in 1944/45 that he wrote his four movement String Quartet No. 3, his final work for string quartet. Korngold had actually given sketches of the score to his wife Luzi at Christmas in 1944. It was in this score that Korngold first included material from his film music notably the Edward A. Blatt film Between Two Worlds (1944) in the Scherzo and the Michael Curtiz film The Sea Wolf (1941) in the Sostenuto. Another feature is how Korngold adopts a more progressive approach by using an economical style of writing employing limpid chromaticism. Details of the first performance have been discovered by Troy Dixon, of the Korngold Society. It took place in 1949 and was given by the New Art Quartet at an ‘Evenings on the Roof’ concert at the Wilshire Ebell Theater, Los Angeles. The opening Allegro moderato is quite outstanding being intense and serious in quality and tinged with a reflective quality. The rhythmic Scherzo is notable, full of scurrying mephistophelian figures. The CPO engineering team has excelled. The sound is warm and clear with the piano nicely balanced with the strings. I found the liner notes by Korngold biographer Brendan G. Carroll well written and informative. The ebb and flow, warm and expressive, is captured splendidly by the Aron Quartet who clearly cherish this music. In the Quintet Henri Sigfridsson demonstrates a deep understanding of the music. All the players are characteristically sensitive and thoughtful, displaying impressive unity, a wide colour palette and lovely beauty of tone. Stunningly performed and recorded this release serves Korngold’s engaging chamber music eminently well.